Cones art' available as single units or moiinted in groups for installation on custom-built drills. They can be supplied with a 7- or 14-inch base diameter and with either knurled or plain base plates. Craftsman also manufacturers a hand-pushed, single-row seeder with single- or doublemetering cones. It has a three-wheel chassis with 12-inch, double-disc openers. Sprockets are available to adjust for row length. The two-cone model is used for simultaneous fertilizer or insecticide treatments during seeding. through a multiselection chain and sprocket drive from the rear wheel with selections for plot lengths from 4i/2 to 30 feet. The double-disc openers are hydraulically controlled and can be equipped with firming wheels and drag coverers. Two seats are provided for operators to load the cones. NOTE: This planter is referred to as a precision planler in the manufacturer's literature, This refers to the precision manufacture and not to precision planting, which requires a seed-cell planter and a short, controlled seed drop. The Swanson plot planter, developed for small test plots for such seeds as soybean, sorghum and kenaf, uses a con«5 arrangement similar to the Craftsman cone. Sprockets are available for tows 3 to 32 feet long. The Oyjord plot drill has a single cone-type dispenser feeding a spinning divider which divides the sample into 2, 4, 6, 8, or 10 openings to correspond with the number of row openers used. The row length can be adjusted to any size between 13 and 49 feet. The drill is available with a three-point hitch or as a self-propelled model with a 4 li.p. engine. A planting rate of 60 to 100 plots per hour is claimed. Equipment for continuous drilling and press-wheels are optional extras. The cone dispenser differs from the Craftsman type in that the seed is guided around a fixed base by wipers and drops from a hole in the base. This plant seeder has been the inspiration behind many new types of planters, it was originally developed by Mr. L.G I. Copp of the Crop Research Division, Department of Scientific-Research, in Christchurch, New Zealand. It is a one-row planting unit, and mounts on a tivo-wheel tractor. Seed is picked up by vacuum through hypodermic needles on a revolving drum with a small vacuum pump. has been improved by using brush cutoffs and a smooth drop tube. 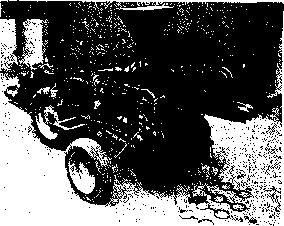 The planter mounts on a four-wheel tractor. Seed is fed to the openers of this self-propelled seeder by either a V-tt Jugh belt or a fluted dispenser and a four-way spinning divider. It is designed for the exacting requirements of research plot experiments. Fertilizer may also be applied through a belt attachment. 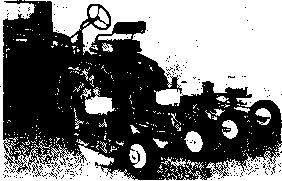 The four-row seeder pictured here is now obsolete because it was made to attach to a Bolens Ridemaster tractor, which is no longer being produced. However, models by other manufacturers are available. Plans are available from the Engineering Research Service, Agriculture Canada, Ottawa, Ontario KIA 0C6 Canada, and similar seeders are commercially available. The first of these is a three-row planter employing two operators, one pulling and the other pushing, and using a seed cup to dispense seed to three row openers. The delivery rate is adjusted by a plate at the bottom of the cup. The cup is hing d to permit dumping of leftover seed. The Walter and Wintersteiger plot drill is a three-wheeled, self-propelled model available with either a full-width or individual hopper seed box. 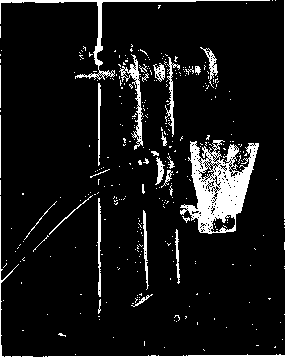 Metering is done by a fluted wVeel. The seed boxes have a provision for dumping unused seed. The machine can be purchased with three to eight row openers and with a two-or three-speed gearbox. Cultivating and spraying attachments are available. Some European seed drills are suited to planting larger plots in that they are mounted on a three-point hitch and have a catch pan to collect seed when regulating the dispensers or when emptying the seed box through an unloading valve at each run. Individual runs can be shut off as desired, or hopper inserts can be used for seed separation in the box. The most common dispenser is a toothed-wheel metering device driven by a gearbox with up to 81 selections. The Plantox drill is a machine mounted on a three-point hitch suitable for horticultural and forestry plantings. The five-row distributor is driven from the tractor PTO. All types of seeds can be planted in rows or wide beds. The Finlay plot seeder is a sophisticated semiautomatic machine for planting large numbers of plots per d; I; uses cartridge loading and a false-bottom seed dispenser, and mailable with one to nine row openers. A plot seeder for sugar beet experiments, this unit meters a premeasured quantity of seed to a plot row and is available as one-row units. A vacuum pickup planter suitable for precision planting of any type of seed is available for tool bar mounting. 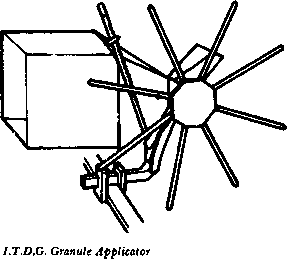 A source of vacuum is required to provide suction to hypodermic needles mounted on a revolving cylinder. The Mat-OSU planter was developed at Oregon State University for fertilizer trials. 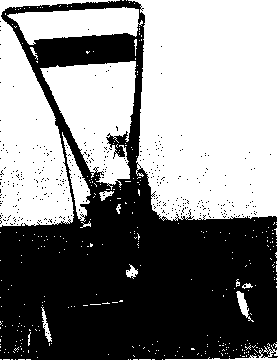 Commercial planters were found unsuitable for the precise planting required, so a vacuum pickup wheel was developed. It has been found suitable for grass, legume, cereal, flower, and tree seeds without grading the seed. Row spacing is adjustable from 12 inches to 6 feet. Fertilizer metering is by Cole top delivery hoppers. Fertilizer can be placed accurately at varying positions in relation to the seed. The MacKey plot drills use a dispenser consisting of a base plate with grooves corresponding to the number of openers, and a seed tray with a press plate which slides along the grooves to deliver seeds to the seed tubes. The tray is geared to traverse its length over the plot length. The hand-pushed model has one to three openers spaced at 6-inch intervals and can be geared for rows 40 to 80 inches long. One hundred 5-foot rows can be planted per hour. The power model has five openers and can be geared for 10- to 20-foot plots. Its capacity is 100 10-foot plots per hour. The N.I.A.E. spaced plant seeder was developed to replace hand dibbling of cereal grains for lattice-planted plots. The planter is cam operated to plant seeds 2 inches apart on a 6-inch row spacing. Holes are made by a series of dibblers, each consisting ot a tube into which a plunger is inserted just before the tube enters the soil. The plungers are then raised and the seed is released from a preloaded, plastic seed magazine. A sowing rate of 500 rows per hour can be attained with a five-man crew. Twenty-three seeds are spaced in a 4-foot row. The planter is powered by a small engine with a 45:1 reduction box.